Before you start to make media room inside your house, you need to know more about home theatre design and how to build them. There are many things to considerate and think of before you can really build your private theater. You want to build a great home theater that not only you can enjoy but one that can also increase the value of your house. This is why you need to carefully plan and build them in the right place and order so you would not regret it in the future. Not to mention the amount of time and money that you would not want to waste when making your dream theater. 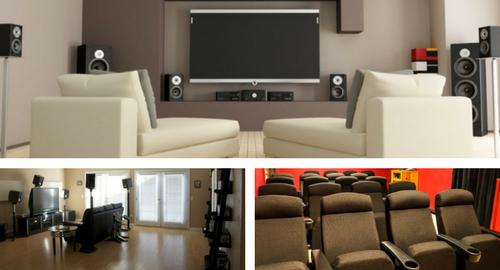 The first thing that you need to consider when creating a movie room is about the home theatre design location. This is important so you will get to control everything in the room, especially for the lights and sound. So a perfect location where you can control those two things is needed. The easiest location that you can use is on the basement since it is more private, dark and quite so everything that you need is already under control. However if you really want to you can still use your spare bedroom, living room, bungalow and many other area in your estate to build a home theater in. but remember that you might need to do more effort to control the sound and lights in those location. After you have chosen the right location for your private theater now is the time for the real challenge, which is the wiring and other home theatre design technical things. You must be able to install all the wire needed for audio, lighting, as well as internet. Audio and lighting wiring is a must for every room and the internet is optional thing to have. However seeing out current technology, you want to make sure your private theater could support all modern device, thus internet access in the home theater is highly recommended. Those wiring should be hidden somewhere along the wall or in any option that you can think of to cover it from view. After the wiring problem has been handled well, now it is time to look on the home theatre design hardware. You need to be able to set the lighting, audio visual and other electronic hardware inside the room. Make sure that you have the right screen size, enough number of audio speakers, and enough lighting fixture to light the room. You might also want to think of how the system works, whether you want to control it in one control station, wireless control, or any other way you can think of. Placement of the hardware also important to considered in your designing process. After the hard things have been taken care of, now you can move on to the fun part which is the home theatre design furniture. Think of how many seats that you want to place and the layout of furniture you use. Of course you also need to see how big your room is and how many people can comfortably use the room at the same time. This is why the size of the furniture also plays a great role in the layout and placement. Think everything carefully before moving on to the last part. You can start to think of the home theatre design theme or style you want to use inside the private theater. Decoration also plays a great factor on how your home theater will look like, so make sure you design everything carefully. Choose a theme that you will always love since it might be difficult to change the theme later on. If you do not know what to do, you can try to see inspiration that we give here and choose one that seems to interest you. Go simple or go big according to your preference so you would not regret it in the future. As everything in the process we have mentioned above is very important, you need to be sure before you can move on. Think of them as one big picture so you can decide one thing while still thinking of the things you need in the future. Try to get a lot of reference if you feel stuck and do not know what to do since there are a lot of home theatre design ideas that could help you in your designing process. The safest route is go simple since you can easily decorate it with simple things. But you cannot go wrong with the theme of your room so you can go as big as you want as long as you have enough budgets to support the idea.